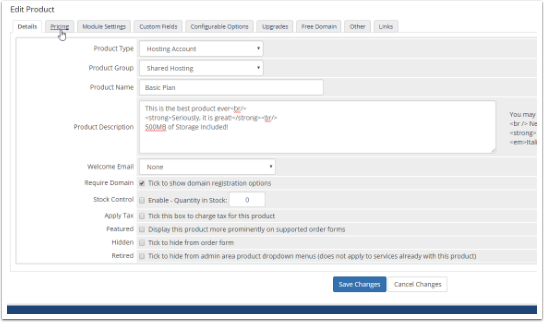 In order to sell something using WHMCS, a Product must be configured and setup in the system. In this Guide, we will walk through that process. On this screen, choose Create a New Product from the options area. In our example we will be creating a new Shared Hosting account. To do this we will want to choose the appropriate Product Type, Product Group, and specify the Name of the new product. After filling out the information, click on Continue. The next page shown will allow the configuration of the product itself, including Product Description, Pricing, Module Settings, etc. We're going to select some of the basic options to get things going. In this case we will fill out the Product Description and ensure the Require Domain option is ticked (as it is necessary for our hosting account). After filling out this first tab, click on the Pricing tab to set your pricing. On the pricing tab, we will want to set the options desired for this hosting product. To keep it simple, we will only sell this on a monthly basis so we will choose the Recurring option and specify our Monthly pricing information as shown. We've also chosen to charge a setup fee in this case. After completing this page, continue to the Module Settings tab. 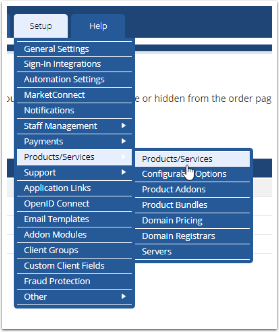 Finally on the Module Settings Page, we need to choose the Module and fill out any of the information for the product setup. In our example, we are using cPanel. Upon choosing the module and Server Group, the WHM Packages should automatically be listed. The packages listed are created from within the WHM interface and pulled into WHMCS. The last option we will want to set is the automatic setup behavior. In our case, we will choose to Automatically Setup the Product as Soon as the First Payment is Received. Click on Save Changes - and you're all done!